Another minimalist creation from the Coore & Crenshaw design team, Dormie Club lies to the north of the Pinehurst Resort in a tract of sandy, wooded terrain that extends to just over 300 acres. It’s a course that's been well received by those in the know since it first opened for play in 2010 so there’s no doubt this 18-hole layout is destined for greater things in terms of its future ranking position. Fairway width is a characteristic attributed to many of the holes here, allowing golfers the opportunity to find the best angle into whatever pin position they are playing to. Proper rough doesn’t really exist beside many of the fairways, with playing corridors simply melting into the native sandy-scrub wasteland. A round begins with five straight par fours, only one of which measures less than 400 yards from the back tees. Stroke index 1, the 477-yard long par four 8th is sandwiched between the only two par threes on the front nine at holes 7 and 9. On the back nine, the 307-yard par four 14th is a fine short par four that plays uphill to a green sloping sharply from back left to front right. Recently, we had the pleasure of playing all 9 Pinehurst courses as well as Dormie. Sean Peterson of golftripjunkie.com was instrumental in coordinating our itinerary and at a reasonable price. I heartily recommend Sean and golftripjunkie.com. After we completed our round at Dormie, my playing partner and sometimes adversary, Moyo, asked me to describe it in one word. I chose “relentless”. He thought that was a good choice. Dormie is a Coore & Crenshaw design. When playing Dormie recognize that it is a par 71. The challenge is the tips are 6800+ yards, the middle 6500+ and the up tees are only 5900+ . If ever a course is screaming for another set of tees, it is Dormie. From the blues it has 6 holes over 400 yards. When we played conditions were miserable. We were in fact the only group on the tee sheet for the entire day. Thus, pace of play was fantastic and one of us was ensured of being medalist. The first hole is pretty much what you see, however your approach is uphill so take an extra club. The 2nd and 3rd holes are your chances to make hay. On two stay right off the tee to avoid being blocked out. The 3rd is an excellent birdie oppty. Less than 300 yards but it is uphill. The par 4 4th is long and has a diabolical green. Aim left and if the pin is front right just move on to the next hole. The 5th is another long par 4 with a redan water hazard. The carry is much longer than it looks off the tee and if you are right, you better have it hit it well or you will pay the price. If the pin is back everything will roll hard right. The par 5 6th is a blind tee shot. Favor the right as the hole falls off on the left side. The 7th is a 200 yard par 3 that looks easy once you get to 8. The 8th is the number one handicap and at 472 yards from the blue tees godspeed. Moyo would not believe me when I told him it was a par 4. No, it is not downhill. The tee shot is slightly uphill and the 2nd shot downhill to set up your wedge to the green. If the pin is right aim at the collar, it will go hard left. I would describe it as a mediocre par 5 and an impossible par 4. The 8th was just the warm up for the par 5 10th weighing in at 632 yards. It is a dogleg left with the 2nd shot needing to carry gunch. Three really good shots and you will be rewarded with a par. The 11th is another long par 4 uphill. The 12th is really the only gimme hole. An uphill 108 yard par 3, take an extra club. The 13th is another long par 4 and is the number 2 handicap. The short par 4 14th, is really your last breather. The 15th is a dogleg right and it is all about how big your appetite is on flying the gunch ravine. The short par 5 17th looks easy on the card, but will require 3 good shots. It has an extremely elevated green with a huge gunch waste bunker in front of it. If you hit a good drive, you probably can only hit your second shot 180 yards. This will leave you about 115 yards out. It is at least an extra club and probably two if the pin is middle or back. The front of the green will reject short shots. Not surprisingly, the 18th is another 400+ yard par 4. The fairway is bisected with a waste area about 250 yards off the tee. On your approach, do not miss left. This is a really good modern design in the heart of the Pinehurst sand hills. The course is fairly hilly and flows down to and around a lake, but the water is essentially never in play here. The design team of Coore/Crenshaw used the land to great advantage and worked the routing very well around the sometimes steep slopes. The fairways are fairly generous, but after playing the course once you realize there is definitely preferred path from the tee to the green that needs to be utilized. On the down side this would be a hard course to walk and some of the women’s tees were ridiculously long ( 10 is a 571-yard par 5 from the front tee. Yikes!). I enjoyed the club and would certainly play here again. 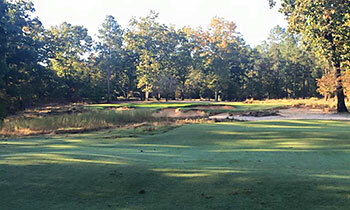 Last summer while in the Pinehurst area I had the pleasure of a 2ndvisit to Dormie Club. I’ve yet to find a Coore & Crenshaw course I really didn’t like. This one is full of great holes but is not without some quirks in the routing that make walking it feel a little disjointed for me. I’ve walked it once and rode once and would say the course leans in the direction of being a cart ball course. It is still very walkable it just doesn’t quite flow right when walking with some of the links between green and next tee. As a side story, not architecture related, this day was the kind of day that everything went right. Sometimes we have those days as golfers (though rarely unfortunately). My daughter (16) was my caddie on the day. This was part of a Father’s Day gift she had given me by way of a coupon book with several creative things I could redeem. Imagine her surprise when I pulled out the coupon and told her I was cashing it in. Why is this relevant you may ask? Well, on the 12thhole I had my first ever hole in 1. Amazing given she had never really caddied for me before and she was there to see it happen. Clearly she thinks this happens all the time now. I also felt as though I couldn’t really miss a putt on the day and ended with an ace and 4 birdies, trust me that’s not my normal golf but it was a very special day with a very special caddie not to mention a friend who is a pro who had also joined and witnessed the fun. Naturally experiences affect how most of us see courses and I’m most likely not above that to some extent though other than giving Dormie a special place in my heart my view of the course still remains unaltered. Though I suppose I now have to say 12 is my favorite hole. Dormie Club might just be my favorite course in the Pinehurst area. I’m certainly a fan of Coore & Crenshaw and admit that this routing is a little bit on the confusing side in a couple places but I had the luxury of playing with a friend that had worked there for years, is an excellent player and knew the course as good as any caddy. That certainly took all of the confusion of crossing holes out of the picture. What’s really great about the course is the sheer variety of holes, the playability and given their uniqueness the ease with which you can remember all of them. There is an excellent mix of short and long par 3’s, 4’s and 5’s, great topographical changes and wonderful land that C&C managed to make the most of. There is one point that I’d really like to make to anyone that plays Dormie when in the area and I think this is a huge plus point. 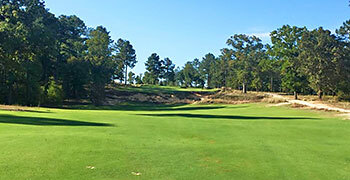 To my knowledge most of the courses in the Pinehurst area are built with Bermuda grass which has specific playing characteristics that to my experience for a large part reward target golf as opposed to allowing a wider variety of shots utilizing the ground to be played. This might vary in dry conditions or when the turf is dormant however, in general there is a huge playability plus to the kind of golf that I enjoy more with the turf and greens at Dormie Club. These have been created with fine bent grasses that serve perfectly to fast and firm playing conditions. While I certainly can’t think of a hole I didn’t like one might suggest if being critical that the 18th does not serve as the type of high impact finishing hole one might expect on such an excellent course. It’s not bad, don’t get me wrong, just not quite a spectacular as other holes on the back 9. My favorite holes were 5, 12, and 17. The par 4 5th hole is a light dogleg left monster at 430 yds and plays slightly uphill after a demanding tee shot over a lake to a fairways that gently slopes left to right. The approach is a mid to long iron and can be ran into the green. The par 3 12th hole is a classic short par 3 with a beautiful green and some great tricky pin positions. It’s framed wonderfully with trees and waste area. Finally the par 5 17th is reminiscent of Pine Valley. A great risk reward hole where a strong drive allows you to go for the green in two but to do so you have to take on the up hill second shot over the waste area which is really a spectacular approach and difficult to judge given the rise in elevation. If you’re in the area for a golf trip, make the effort to get out here.